This naturalistic portrait of the emperor Vespasian (reigned 69-79 C.E.) clearly shows the lined complexion of this battle-hardened emperor, and also the curious ‘strained expression’ which the Roman writer Suetonius said he had at all times. The loss of the nose is characteristic of the damage often suffered by ancient statues, either through deliberate mutilation or through falling or being toppled from their base. Vespasian was born in the Roman town of Reate (Rieti), about forty miles (sixty-five kilometers) north-west of Rome in the Sabine Hills. 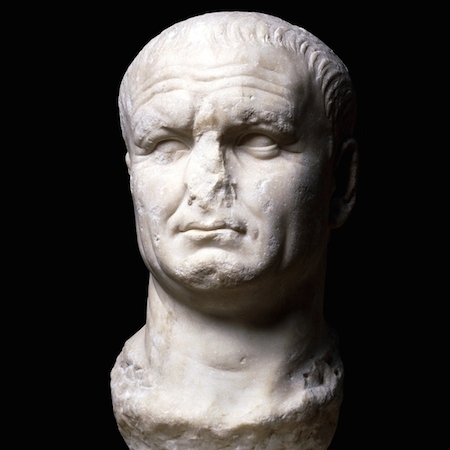 Vespasian distinguished himself in military campaigns in Britain and later became a trusted aide of the emperor Nero. Together with one of his sons, Titus, Vespasian conquered Judaea in 75 C.E. and celebrated with a magnificent triumphal procession through Rome. 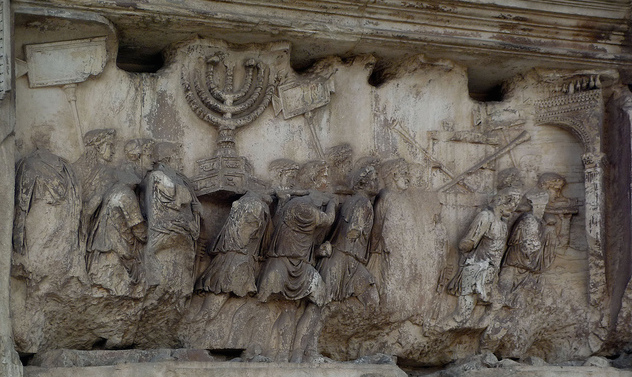 Part of the event, in particular the displaying of the seven-branched candlestick or “Menorah” from the Temple at Jerusalem, is shown on the Arch of Titus, in Rome (above). The proceeds from the conquest of Judaea provided funds for the building of the Colosseum and other famous buildings in Rome. Portrait sculptures are one of the great legacies of Roman art. Busts and statues portraying men, women and children from most ranks of society were set up in houses, tombs and public buildings throughout the Roman Empire. Sculptures of emperors and magistrates were often thought to embody personal authority, whereas many of the portraits representing private citizens were intended as memorials to the dead. S. Walker, Greek and Roman portraits (London, The British Museum Press, 1995). S. Walker, Roman art (London, 1991). Cite this page as: The British Museum, "Portrait of Vespasian," in Smarthistory, March 2, 2017, accessed April 21, 2019, https://smarthistory.org/portrait-of-vespasian/.